Are you interested in a unique on-foot adventure to learn about a 40,000 old living culture through some of the most expansive and healthy ecosystems on our planet? Then the Lurujarri Heritage Trail, a nine day walk up the Dampier Peninsula in the Kimberley, should take pole position on your bucket list. There are not many places on the planet where families who are custodians of an ancient living Songline will welcome you to join them as they walk their country and tell stories about the Dreamtime (Bugarregarre) while interpreting the living landscape on foot. Be prepared; the walk is challenging, rewarding and transformative. From the never-ending soft sandy dunes – walking solidly to beat the incoming tides and midday heat – to relaxing under a melaleuca grove with a cool breeze while carving clap sticks or spears, after consuming a healthy and delicious freshly caught lunch, this is a unique experience. It’s an experience that forces you to slow down and consider what life would have been like millennia ago, it’s a place where everything functions in harmony. 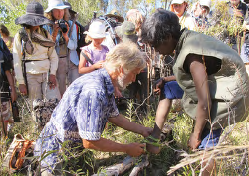 Paddy Roe, a well-respected Traditional Custodian and law boss began the trail in 1987, as a trigger to encourage the members of the Goolarabooloo community to walk the country again, as had always been done; to conserve, renew and stay connected with their heritage and traditional skills and to keep the same alive for generations to come. Due to his work on the trail and reconciliation in the community, the Governor-General awarded him the Order of Australia Medal in 1990. You’d think that there wouldn’t be that many types of ecosystems which make up the trail, looking at the land from the air or by simply talking a stroll at James Price Point. But nothing could be further from the truth. 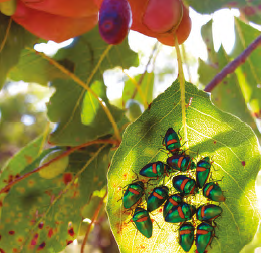 There are valuable threatened ecological communities called monsoon vine-thickets, which grow in groves behind the dunes and are rich with various bush fruits and berries from the marool (native blackberry) to the mamjen (orange berries) that are important sources of bush tucker. Crossing from the Goolarabooloo home base at Coconut Wells, you’ll find inland mangrove mudflats covered with flocks of rare birds including jabiru and brolgas. Beyond the creeks that flow towards the sea there are melaleuca wetlands just brimming with butterflies, reptiles and amphibians. Then as you cross the dunes between camping spots along the coast - desert sounds you – and ancient spearheads with tips and grinding rocks become the only visible signs of life. However, beneath the dunes, is where Goolarabooloo ancestors are buried. It is not uncommon for the sand to drift and for burial sites to become uncovered – their re-burial is part of Traditional Custodian duties. When you reach the sea, at various points you might be lucky enough to spot a humpback whale breaching with her calf by her side, some coastal dolphins playing in the shallows or endangered seabirds like osprey nesting on the pindan cliffs. The flotsam that you’ll find on the high tide mark is like no other - sponges, sea fans and shellfish. They tell the tale of what lies just off the coast – unique coral reefs and sponge gardens – with new species continually being discovered on each voyage to the region. If you are camping near one of the creeks – Barred Creek in particular – it’s highly recommended that you pack a quality insect repellent, as the sand flies and mosquitoes can be brutal, not that you’d think it watching the pelicans glide by in procession without a care in the world. Barred Creek is also known for the brown snake, so if you are thinking of visiting the trail without guides and are unfamiliar to this country, be sure to read the well located signs, tread lightly and be aware. The Lurujarri Dreaming Trail is highly recommended by guide and if you do so, you could get the opportunity to learn how to carve clap sticks (cumbuk) and spears. Once the sun goes down you can tune into dreamtime stories which are shared around the campfire of connections along the west coast of the Dampier Peninsula, giving an insight into how past custodians of the land would have moved with the abundance of the seasons, choosing different sites to camp across the six seasons of the Indigenous calendar. Walking by the majestic red cliffs of James Price Point that stretch for miles really gives you a different perspective to the coastal beauty and cultural practices, as middens (ancient shell rubbish piles) had built up in many metres of visible layers of pindan country. If geology is more your thing, then be sure to walk the beaches around Quondong Point where dinosaur track prints from the Dreamtime story of the Murrella (emu man) can be found with the assistance of Goolarabooloo guides. Even though new science says that some of the footprints are more than 130 million years old, a few of the Theropod footprints and ancient cycads look like freshly-stomped emu prints and birds’ feathers. It is well worth the journey to reach Coulomb Point Nature Reserve, where the final day of trekking will take you to Yellow River and the end of the road. Making your way up Yellow River can be a godly experience, as the river is known to draw you in. Many people have found their way onto different creek paths, becoming lost for days. The beauty and pull of the river is ever present. Up this river you may be lucky enough to find bush honey in the hollow of the melaleuca tree, with native bees that taste like sweet lime. Traditional practice is for the honey tree to be repaired with vines that have healing properties – the snake vine. 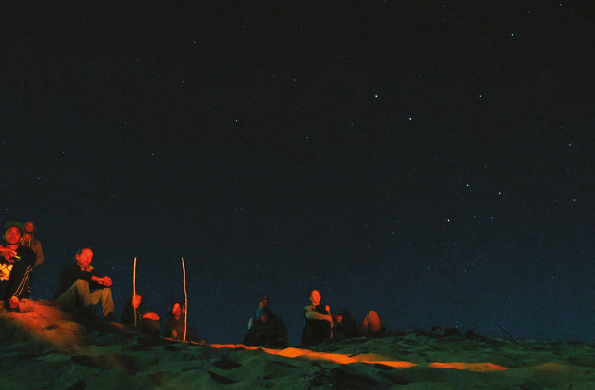 On the last night of the trek, after a glorious sunset, nightfall will bring with it myriad stars which will become the backdrop to the end of the cultural journey – a Pelican Corroboree. Songs will be sung around the campfire, lead by one of the elders, with the younger members dancing as painted pelicans – the symbol of Goolarabooloo – which translates directly as ‘west coast dunes, law and culture’. Over the years there have been various types of developments posed over Goolarabooloo country – sand-mining, a huge gas plant and port proposal and now gas fracking looms. Yet – it is still so well cared for, and is such a spectacular example of eons of sustainable living. Even with the challenges of modern influences on the indigenous culture, the trail is a profound and truthful experience for those wanting to further understand living Indigenous law and culture in an epic, intact land and seascape. The Lurujarri Heritage Trail now needs recognition as part of our National Heritage, so future generations don’t need to keep fighting for their country and so they can continue to share and celebrate their culture. Many thanks to the Goolarabooloo family and friends for providing such an incredible experience and for continuing to share their culture and country with others from around Australia and the world. Dry season (April-September) is the time to visit the stunning Kimberley region. There are four guided tours for the Lurujarri Heritage Trail on this year from July to September, which are highly recommended. The whole nine days are a fantastic opportunity to really understand how spectacular the Kimberley coast is, with Traditional Owner guides who explain their culture and customs as you walk and volunteers who assist in setting up camp every night and cooking a meal for the trail walkers. The Lurujarri Dreaming Trail follows the coastline 80km north of Broome to Coulomb Point Nature Reserve, as part of an ancient song cycle that has been walked and sung for millennia by traditional custodians. The closest supply base is Broome, so if you miss-out on a place on the guided trail or only have a day or two, ensure you are self-sufficient if planning to visit. There are some popular campsites along the trail, with locations like Quondong Point and James Price Point topping the list. In Broome, there are many accommodation options, but it’s expensive, free camping is frowned upon and policed and the CP is not pet-friendly in ‘peak’ season. 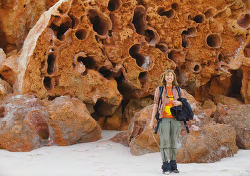 Along the Lurujarri Heritage Trail you’ll find ancient dinosaur footprint trackways, unique edible vine-thicket and humpback whales calving just off the coast. 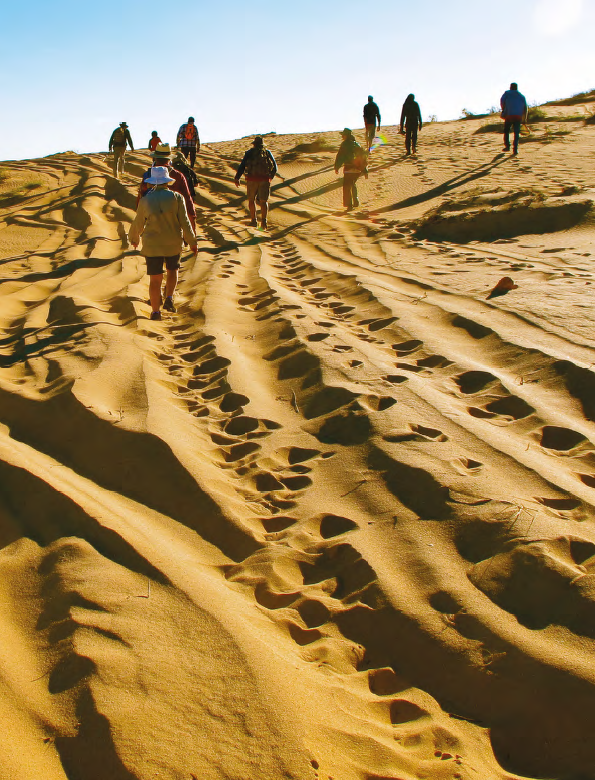 The best way to truly understand the ancient living culture of the Goolarabooloo people is to join the nine-day walking tour along the dunes from Broome to Yellow River. Broome is one of the most diverse towns in Northern Australia. It has an airport five mins from town, a hospital, a vibrant ‘China town’ main strip with tourist shops, supermarkets and banks. There is a regular Sunday market at the old court house, and monthly viewings of the ‘staircase to the moon’ beyond the mangroves at Tone Beach. The guided trail is all inclusive for meals, but BYO snacks. If you would like the opportunity to walk the Lurujarri Heritage trail, visit the website: www.goolarabooloo.org.au/Lurujarri or email: goolarabooloo@hotmail.com to book or register your interest for a place.